After 8 years with her group Orioxy, Julie has begun a unique musical adventure in a purely instrumental form. 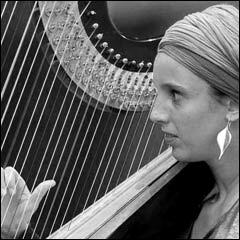 Harpist Julie Campiche�s work is an on-going process of musical innovation. Through research and experimentation she has developed the use of electronic effects that enhance the scope of her improvisational work. She has a very personnel technique and her own musical language. The new project evolves in a strangely melancholic atmosphere with out-of-sync cinematic grooves. The electronic effects intertwine in a delicate yet powerful acoustic space. This uncluttered electro-acoustical experience leaves a lot of room for a wide range of improvisation. Julie�s compositions are inspired by some of her generation�s most urgent concerns. Her music induces reverie or it focuses on current events, such as in Onkalo that derives its name from a stockpile of radioactive waste. We also find Flash Info, which evokes the media�s incessant flow of news.